The Earth has always fascinated people from the dawn of time. Whether they were created by natural causes or mankind, holes and craters in the ground abound in legends and myths. The most common belief was that endless and dark holes led to other worlds and dimensions, most notably to Hell, where wretched souls would burn for eternity. This has kept generations of people away from the mysterious depths of Earth, but in our age man has become braver and less superstitious, especially when he found out about the riches and treasures he could find. It is difficult to say exactly which is the deepest hole in the world, since these craters come in different forms and on various lands. The following top lists the most interesting holes on our planet. 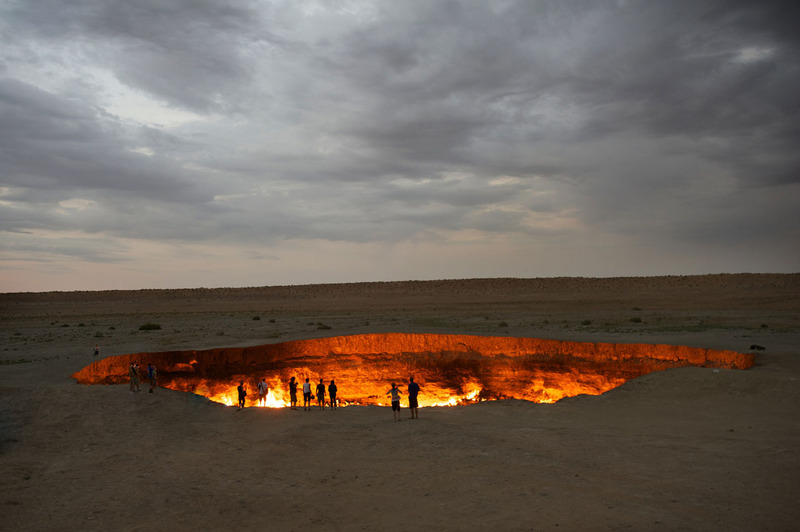 The best representation of the door to Hell is surely the Darvaza Gas Crater. Located in the Karakum desert in Turkmenistan, the crater burns continuously, giving the impression of a portal towards another world. It was discovered in 1971 by some geologists who wanted to tap natural gas from an underground deposit. However, while they were excavating, a drilling rig collapsed into a hidden underground crater. Because gases started to escape the cavern, the hole was set aflame and since then it hasn’t been put out. The Door to Hell is 20 meters deep and has a diameter of 60 meters, far from the deepest hole in the world. This crater held an impressive treasure of Earth, which yielded an astounding amount of 6,000 lb of diamonds. 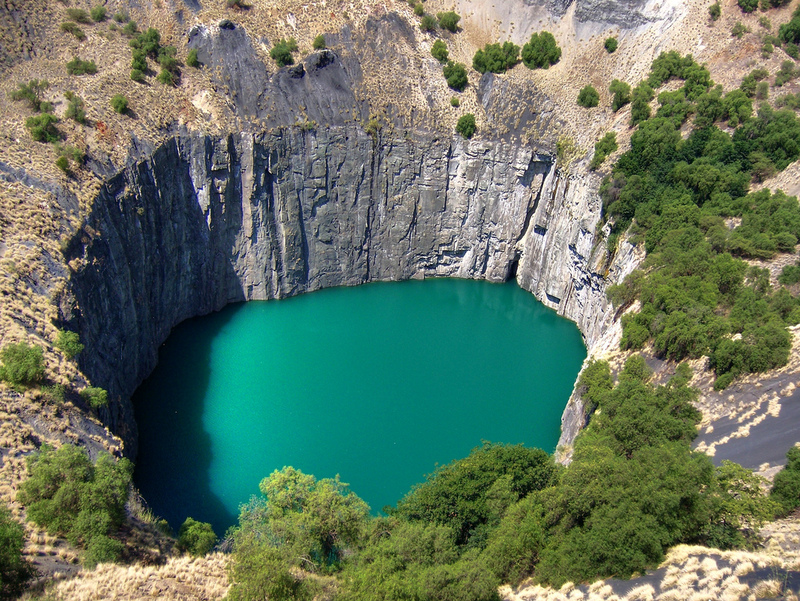 The Diamond Mine was named Kimberley after the name of its location in South Africa. Between 1866 and 1914 miners have dug up this 1097 meters deep excavation site without any modern means. Today, the Big Hole is classified as the largest man made hole in the world, but its title is disputed. Furthermore, it may soon be considered one of the world’s heritage sites. While we are on the subject of diamond mines, we also have to mention another one which has been closed only five years ago in Russia. The Udachnaya Pipe is owned by Alrosa, a Russian diamond company, who started excavating the precious mineral back in 1955. Each year it produced an impressive amount of 10.4 million carats value of diamonds. However, the operations came to a stop in 2010 when they were transferred to underground mining. The 600 meters deep mine is ranked as the third deepest hole ever dug of its kind. As nice and shiny as diamonds are, copper also has notable mines. The Chuquicamata mine in Chile holds the title of the largest production of copper. However, it is not the deepest mine in the world, being only 850 meters deep, 3 km wide and 4.3 km long. From Hell holes and diamond mines, holes can also be found in the water. 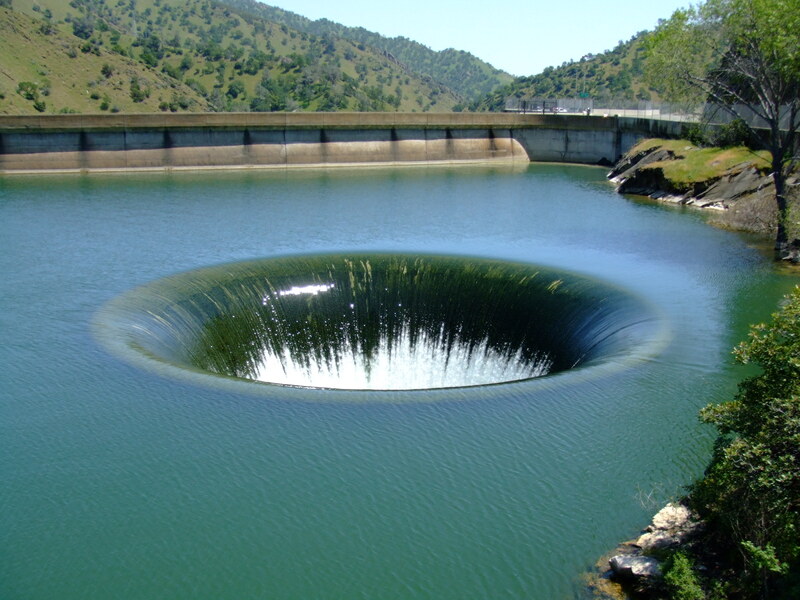 Located in the U.S. in Calfornia’s Napa County, the Monticello dam is the deepest hole in the world of this type. It allows 48,400 cubic feet of water to pass every second in a circular spillway. But what is its purpose? The dam was built in order to allow the water to pass through whenever it reaches full capacity. Another hole linked to Hell is Dean’s Blue Hole, although this one does not have flames at its entrance. Legend says that the Devil himself dug this hole of 202 meters in the waters near Clarence Town in the Bahamas, and that whoever is brave enough to swim by it has been dragged into it. In spite of this grim story, many adventurers have survived a swim and had the wonderful opportunity of meeting friendly turtles and fish. 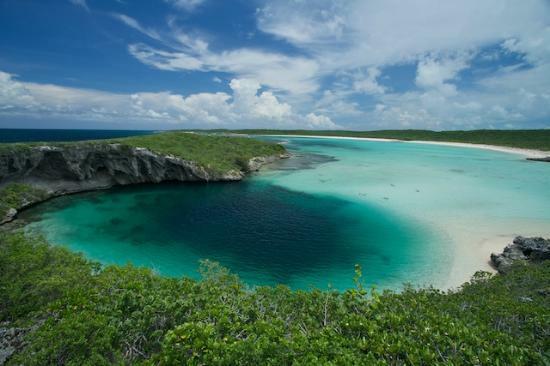 Today, Dean’s Blue Hole is used as a spot for diving championship events, most notably Vertical Blue. Last but not least, there is the Heavenly Pit, a breathtaking piece of landscape and the deepest natural hole in the world. Measuring 537 meters wide and 626 meters long, the 662 meters deep hole was created when the earth sunk, a process that took about 128,000 years. It is frequently sought by BASE-jumping adventurers who find their way to China, in the Chongqing District in Xiaozhai, Tiankeng. Its particularity consists in an underground river that flows beneath it, as well as the waterfall that forms when it rains heavily. The Heavenly Pit and its river were explored in 1994 during the China Caves Project. Although the title of the deepest hole in the world is disputed, the craters of Earth continue to fascinate us through their variety and locations, as well as legends and myths.